Once you realize how soft, warm, and stretchy fleece fabric is, you'll want to learn how to make a fleece stocking cap. Fleece stocking caps are extremely easy to make. Stretchy fleece is easy to fit and easy to sew. Fleece's bright colors and prints lend themselves to cheerful looking winter caps. 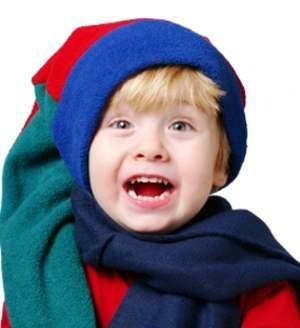 Kids are attracted to fleece, because it is lightweight, doesn't scratch or itch, and is very warm. Making fleece stocking caps is so easy that it can become a family project. Fleece has nap. To avoid color variation from light being reflected differently off the nap when the fabric is laid out in different directions, you should have enough fleece fabric to lay out all the pattern pieces in one direction. Note that fleece has both a right and a wrong side; the sides can sometimes be indistinguishable. Make sure when you buy fleece that you pay attention to the right side of the fabric. You may wish to mark the edge of the fleece on the right side so that you avoid confusion. Fleece fabric comes in different weights. Choose the weight so that it's suitable for your project; you'll probably want a lighter weight fleece for a baby's stocking cap than for an adult man's cap. Most hat patterns suggest medium weight fleece. You can cut fleece with dressmaker's shears or pinking shears. Use pinking shears if you don't intend to finish raw edges with stitching. Fleece is not usually hemmed; instead, the edges can be zig-zag stitched by machine, stitched with a serger, hand finished with a blanket or whip stitch, or scalloped with a blind hem stitch on the sewing machine. It's also possible to use a decorative machine stitch for finishing edges. If you plan to add snaps, buttons, or other heavy decorations to your finished stocking cap, you'll need to reinforce the back of the fabric with iron-on webbing before you apply these details. Be careful to use a cool iron to iron webbing or to iron seams, because fleece can melt at high temperatures. Fleece stocking caps are typically fitted to the forehead circumference and have a pompom or other decoration on the top of the hat. A variation on the stocking cap is a triangular cap that extends well beyond the top of the head and drapes over the back or shoulder of the wearer (imagine Santa's hat with the white pompom at the end of a long cap). Another common variation of the stocking cap is a jester's cap, which has two points at the top. It is usually made of two colors. Kids seem to be especially fond of jester caps. Fleece stocking caps are easy projects, and you'll enjoy trying out all the variations. Beginners may want to start with the rectangular fleece hat, since this is the easiest style to create. The simplest stocking cap is made from a rectangle of fleece. The width of the rectangle is slightly larger than the circumference of the wearer's head. With right sides of the fabric together, sew the vertical cut edges are together. Turn the hat right side out, and turn up the bottom edge to create a rolled brim. Gather the top together with gathering stitches, or tie it with a piece of cord. You can fringe the fabric above the gathers, or it can be left plain. If you plan to fringe the top edge, sew a horizontal line of stitching around the circumference of the hat. With scissors, cut the fringe almost to the line of stitching. The stitching acts as a guide and also to stabilize the fringe. You can make a stocking cap with a long tail by cutting a long triangle. While the length of the hat is a matter of personal preference, you'll need to measure carefully to determine the circumference of the hat's base. To get this dimension, simply measure the wearer's head circumference. Utah State University Cooperative Extension has excellent directions for how to make a triangular fleece stocking cap in a downloadable PDF. An Internet search for "fleece hat patterns" or "cap patterns" will also turn up a number of sewing patterns for sale at auction sites and sewing sites. You'll also find a large number of free directions for making fleece hats on the Internet. Fleece stocking caps are warm and comfortable, and they make great gifts for both kids and adults. Use your imagination to combine colors and prints. Use different colors of fleece to make pieced caps, such as jesters' hats. Recipients will treasure your handmade fleece caps.